Will this high-definition camera beam back evidence of the Apollo moon landings? Those tedious arguments about whether or not the Apollo moon landings were staged could be all over next month. Japan is to launch its Selene satellite on the most extensive lunar mission since the US program ended in 1975. On board the probe will be the first space-going high-definition movie camera to be pointed directly at the moon. The camera has been developed by Japan's national broadcaster NHK together with the Japan Aerospace Exploration Agency ( JAXA ). It will be used specifically to study the moon and will be on the Selene mission when it is launched towards its lunar orbit on 16 August. Faced with the harsh environment of space, the camera has been engineered to operate in a vacuum. 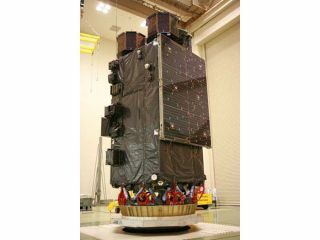 It'll be able to withstand the challenges posed by launch, vibration and space radiation while beaming back HD TV images taken by three 2.2-megapixel CCD sensors. Starting this autumn, those pictures will be transmitted from the Selene in its orbit 100km above the moon's surface to a relay satellite at 2,400km. They'll then be transmitted across a 10Mbit/s link to Nagano, from where they'll be sent for processing to a station near Tokyo. Although it's unlikely we'll catch a glimpse of any of the space junk left on the moon by the Apollo missions, we should get some spectacular images of Earth's only natural satellite.